Laura Schmitt NE: May is Ehlers Danlos and Arthritis Awareness Month - food? May is Ehlers Danlos and Arthritis Awareness Month - food? It's Awareness Time! 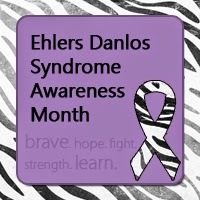 Truth be told, we are always aware of Ehlers Danlos Syndrome as it plagues the life of our child with a long list of symptoms. The worst symptom she is dealing with is recurring shoulder dislocations. We have a wonderful medical team of specialists to help us through these trying times, but there is no cure for Ehlers Danlos Syndrome. My hope is that there will be more permanent solutions and earlier identification to help people with this condition. In our family, we discovered that our own bodies had strong negative response to certain foods and we find a combination of other foods can also cause upset. We are a touchy tummy group. My daughter is diagnosed with Celiac, whereas I discovered my offending foods through trial and error as a teenager with an ulcer and chronic relfux. I can't help but to wonder, now, if EDS was the chicken, or the egg, in our quest to understand our tummies. As for arthritis, it has been reported that a diet based on low inflammation protocol has been helpful for those suffering with this condition. Dr. Terry Wahls, known well for her work in defeating Multiple Sclerosis through dietary intervention, has a wonderful low inflammation protocol. Is it a coincidence that low inflammation diets typically avoid gluten and dairy? Not at all. These difficult to digest proteins can be swapped out for a wider variety of alternatives. Just like with fruits and veggies, it is important to get variety in our grains and protein sources in order to attain a balance of minerals and nutrients. So, while we are educating ourselves on new topics, and health in general, it's worth spending a bit of time boosting up those colorful fruits, veggies, and easy to digest grain alternatives such as buckwheat. We can look to reduce sugars and refined grains and look for lean pasture raised meats and omega 3 rich fish. This approach can be very helpful for a variety of health concerns, not unlike the ones mentioned above.